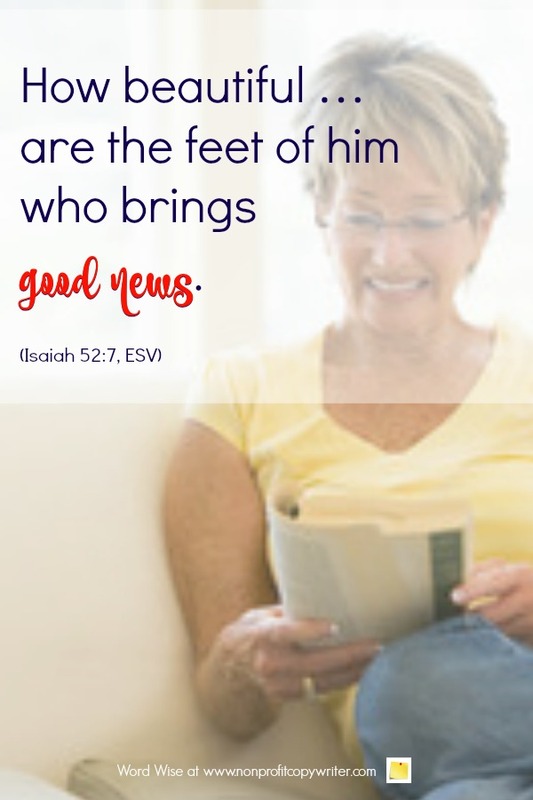 How beautiful … are the feet of him who brings good news. Her words rang in the beat of silence that followed. Staff additions and board shifts were top of mind for the team because those changes affected how we conducted our day-to-day work. But they were a footnote for our reader – one that we eventually relegated to a newsy box on page 3 – because those changes didn’t really affect them too much. Who was doing what – that’s ho-hum for readers. They experience personnel changes at work, school, and in the community every week and every month. But to read about a transformed life ... now that’s real news for our readers. They can never hear enough inspiring stories about life change. Is our work having an impact? If so, how? For whom? Our readers invest their resources, volunteer hours, prayers, and other practical help. They are hungry to hear the outcome. Stories of transformation show the hand of God on the move. It’s the kind of news that is inspiring and encouraging because it’s good news and it’s true. The real news to our readers is changed lives. What is the most important news for your readers? Readers can never hear enough good news. Thank you for working so powerfully to transform lives. Show me how to communicate your movement in order to encourage my readers that you are actively working.